Information about inlay jewelry repair. Ring inlaid with gray dinosaur bone by Hileman Silver Jewelry. You’ve found that perfect ring online and now you are ready to select your ring size. You pause as you think back to a couple of years ago when you bought your last ring. Was I a size 7 or 7 1/2? I have gained a couple of pounds over the holidays…let’s just go with a size 8. Guessing and guessing wrong is not a disaster with traditional gold and gemstone rings. In most cases, if your ring arrives and it is too big or too small, you can take it to a local jeweler and pay to have it sized to your correct ring size. This is not the case with inlay rings. Rings inlaid with just about any inlay material are difficult to size without damaging the inlay. The first issue is the epoxy that secures the pieces of inlay in the ring’s inlay channel. The epoxy is quite hard with very little flexibility and bending the ring to make it larger or smaller puts stress on the epoxy. This stress can cause the bond between the inlay material and the ring mounting to be compromised which could lead to one or all of the inlay pieces falling out. This same stress can also cause the inlay pieces to crack if they break before the epoxy does. For a jeweler to avoid stressing the inlay and epoxy, all of the bending of the metal to make the ring smaller or larger needs to be done in the bottom half of the ring where there is not any inlay. You really need a laser welder to size inlay rings. Even if the jeweler is successful in bending the ring to the correct size, there is still one more critical step- joining the metal back together. 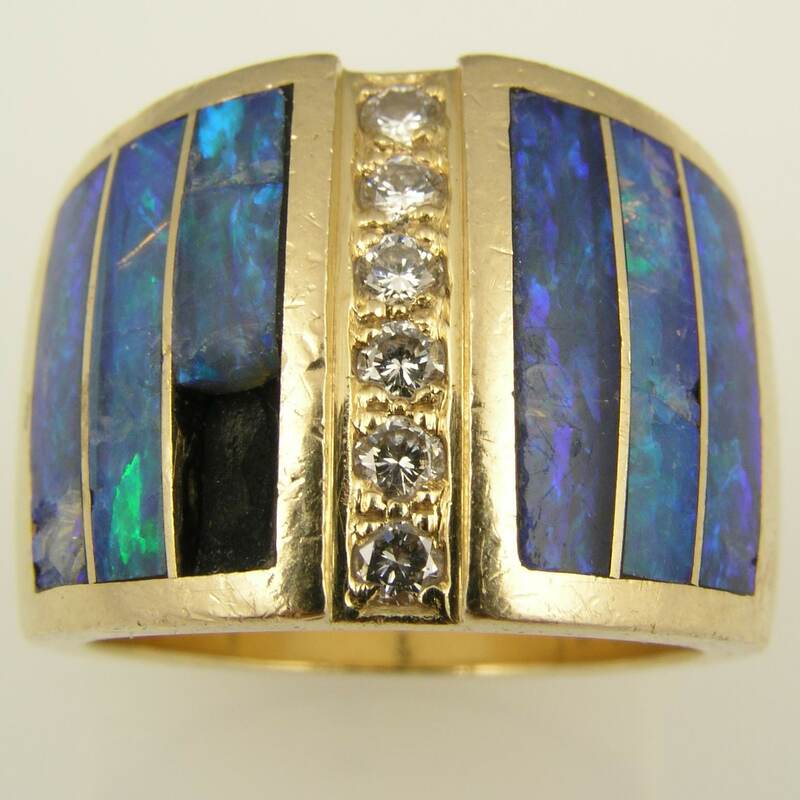 Traditional rings would just be soldered back together using a torch but inlay rings cannot tolerate that kind of heat. The heat from the torch will ruin the epoxy and most likely scorch the inlay materials. The only good option to rejoin the metal is a laser welder. A laser welder produces highly localized heat so the jeweler can work safely on the bottom part of the ring and not damage the inlay. More and more jewelers are using laser welders and some will be willing to try to size your inlay ring if you are willing to risk the possible damage. All of this sizing drama and expense can be avoided by getting your finger sized accurately before ordering your new inlay ring. The easiest and most accurate way to measure your finger size is to visit a local jewelry store and ask them to determine your ring size. You may want to visit more than one jeweler just to confirm your size. It is important to use a sizer that is approximately the same width as the ring you intend to purchase. It is also important to use a sizer that is comfort fit if you are shopping for a comfort fit band. You may wear a smaller size in a comfort fit band than a non-comfort fit band. The only other acceptable and accurate method is to take a ring that currently fits (the finger your new ring will be worn on) to a jeweler and have them determine the size of the ring or you could ship the ring to be used for size reference to the jeweler that will be making your new inlay ring. The jeweler can then measure the size of the ring with the same measuring tool that will be used to make your inlay ring. Paper finger sizers are NOT accurate! the size of your knuckle. The paper test asks you to print and cut out a paper finger sizer. You then cut a slit on one end of the paper strip and insert the other end through the slit and pull it snug around your finger. All you have to do next is read the tiny numbers and marks on the paper to determine your ring size. What could possibly go wrong! The secret test is recommended if you are trying to surprise your loved one with a ring and don’t know their size. The first challenge is going to be finding a ring that you know currently fits and fits the finger you want them to wear it on. The next step is printing a sizing chart with circles representing different ring sizes. Just lay the ring over the circles until you find the one that is closest to the same size. Keep in mind that just a small error of 0.4mm could mean you are 1/2 of a size off which could mean the ring falls off or won’t even go over the knuckle. We have experimented with these methods and found them to be highly inaccurate with errors of half a size up to a whole size. Again, these inaccuracies are not a big deal for a traditional ring but are not acceptable for an inlay ring. What if I do every thing right and my new inlay ring still doesn’t fit? It’s not the end of the world. 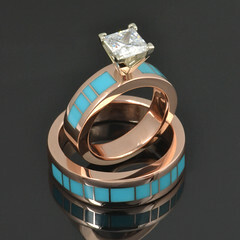 If at all possible it is best to avoid cutting and sizing the ring to mitigate the risk of damaging any of the inlay. If the ring is too big or spins after going over the knuckle, small sizing balls or a sizing pillow can be laser welded inside the shank (bottom) of the ring to snug it up. This method also allows for the balls or pillow to be removed should the wearer gain weight. If the ring is a just a little snug, it may be possible to grind some of the metal from the inside of the ring to loosen it up a little. Getting sized by a jeweler increases the odds that any sizing error will be small and less risky to correct. In some cases where the customer uses inaccurate methods to determine their ring size the sizing error is so far off that the ring cannot be resized and a new ring would have to be made. We are inlay jewelry experts. 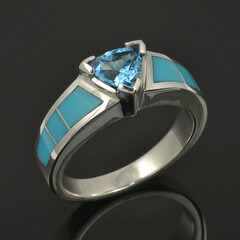 We have been creating inlay jewelry since 1974 and would love to help you with all your inlay jewelry needs. Contact us to get started building your new inlay ring, wedding ring or engagement ring. 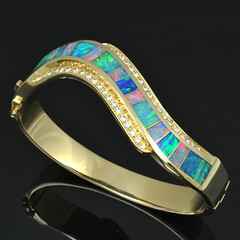 We specialize in dinosaur bone, turquoise, lab created opal and Australian opal inlaid in sterling silver, gold, platinum and stainless steel. Visit www.HilemanSilverJewelry.com or www.TheHilemanCollection.com to see our creations. Just launched our inlay jewelry repair website! Inlay ring in need of repair! We just launched our inlay jewelry repair website! After years of doing inlay repairs on our jewelry and many other jewelers’ inlay work, we thought it was time to start promoting our services. Here is a little information from the new inlay jewelry repair site. Mark Hileman of The Hileman Collection and Hileman Silver Jewelry has been creating and repairing inlay jewelry since 1974. 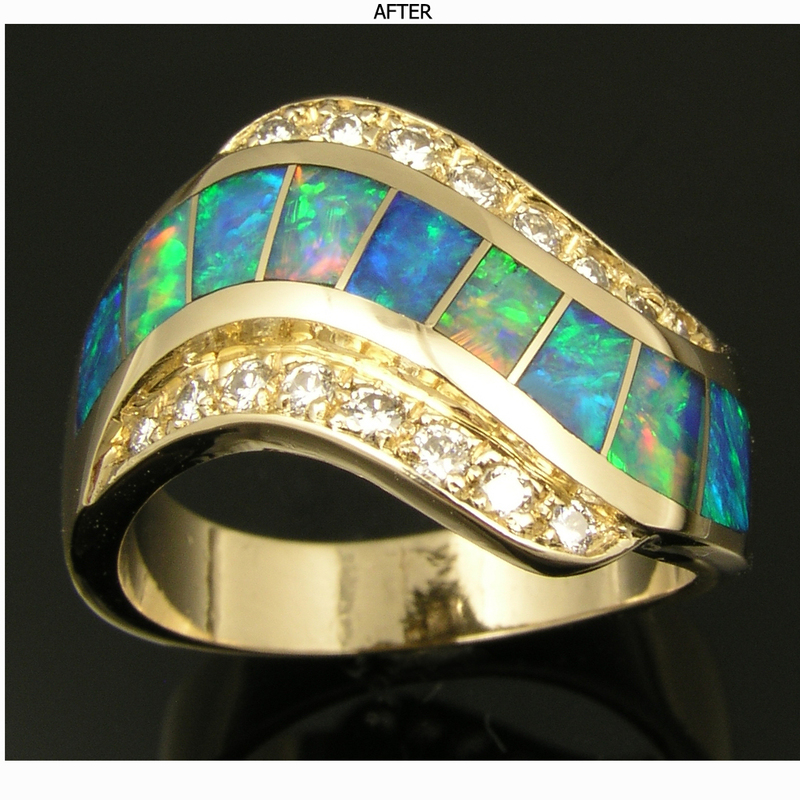 We specialize in the repair of Australian opal inlay jewelry, but can repair your turquoise, lapis, coral, sugilite, onyx, chrysoprase and dinosaur bone inlay jewelry as well. 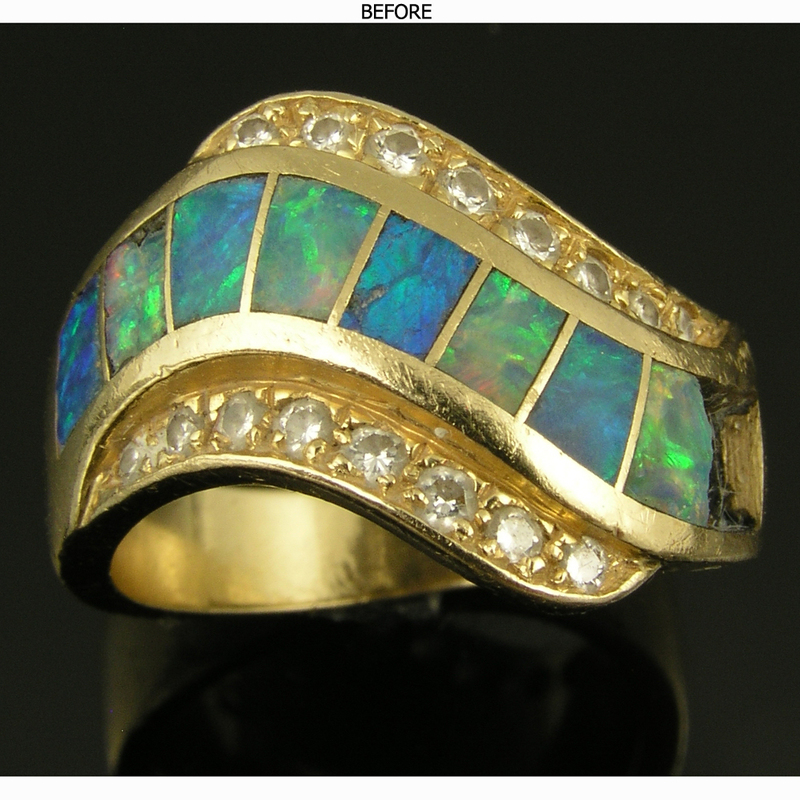 We are experts in the lapidary field and can repair and restore most jewelry to like new condition. We do inlay repair work on all the major inlay jewelry manufacturers such as Kabana, Nagalle, John Bagley, Mark Hileman and many others. We also offer laser welding services such as inlay ring sizing, earring post replacement and other repair work that can’t be done through conventional soldering methods. We offer all of our services to the jewelry trade and directly to the consumer as well.